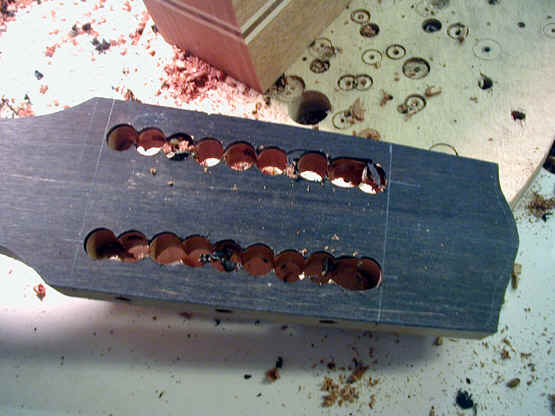 Earlier I showed the process for drilling the gear holes on a slotted peghead. Here I am beginning the process of making the slots. 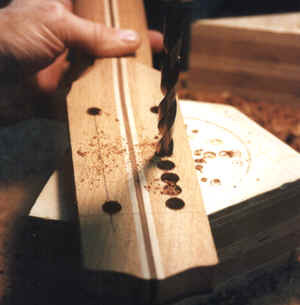 I begin by carefully marking the location of the slot and drill out most of the waste wood. The slots themselves are cut on a router. 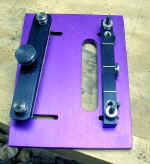 The purple device is a jig which holds the peghead and has a slot to run a router in. The router has a guide bushing to follow the slot in the jig (which comes from LMI). Quite effective. Here is just the jig. 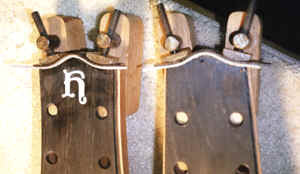 Here is the current batch of necks with the pegheads shaped. 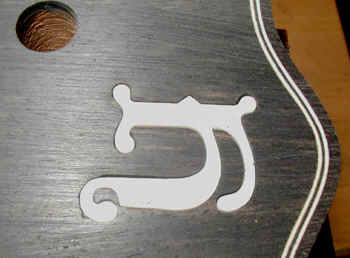 The next step is to inlay my trademark H into the peghead. 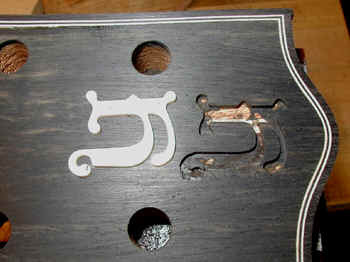 I have the pearl H prepared by a company (Ellis Pearl Works) which cuts them with a CNC router. (Frank Ford just put a very interesting piece about his trip to Tom Ellis' shop on his web site. Look for it HERE.) This provides great accuracy and uniformity. Tom Ellis also provided a block of phenolic with the H cut in reverse (see next photo). this is mounted on the back of the peghead with double stick tape and acts as the template for a minature pin router I have made with a Dremmel tool. 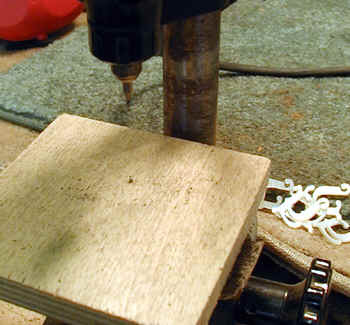 This photo shows the pin router. You can see a very small pin set in the table - this is the same exact size as the cutter, and is directly under it. 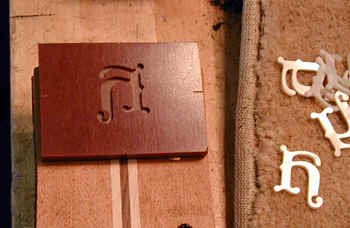 Here is the reverse template with some of the pearl inlays. 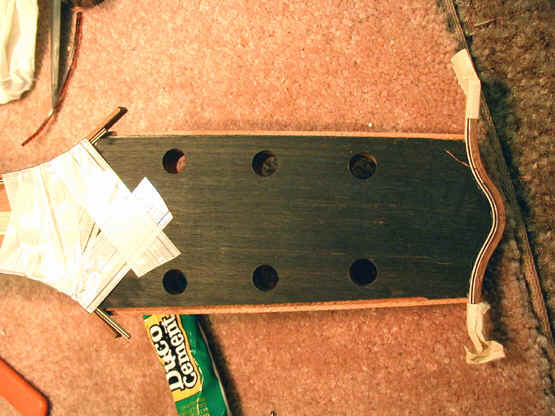 The template is mounted on the back of the peghead with double stick tape. 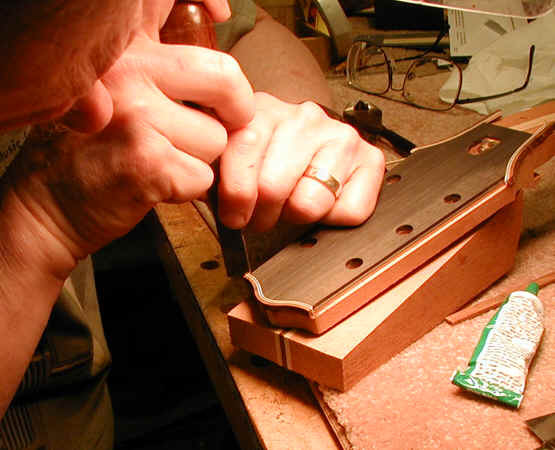 Here I am cutting the inlay cavity. The final fit is quite good. Only a small amount to filler is needed. I use fine ebony dust and cyanoacrolate glue. Here I am beginning to glue in the purfling and binding on the pegheads - the jigs are homemade. I have used them for 25 years. The shafts were purchased from a machine shop supply company and have swivel feet on them. I use a Plexiglas caul shaped to match the curve of the peghead and the whole process works quite well. 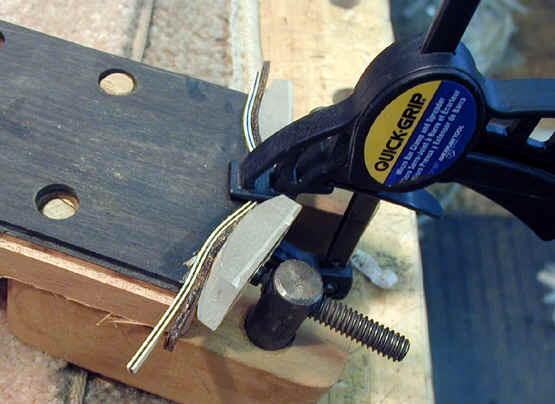 Clamping the binding at the "neck end" is just a bit of strapping tape. 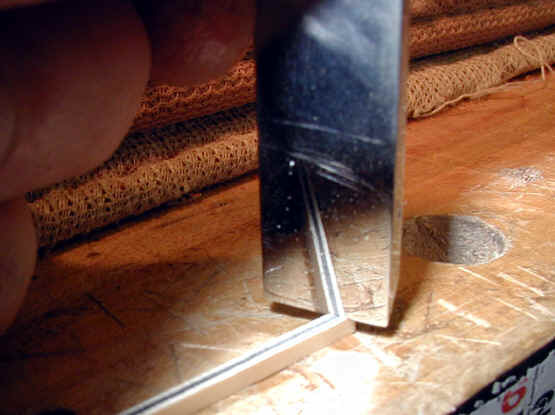 The easiest way to cut miters accurately on purfling is to use a chisel on which the back has been polished to a mirror finish. 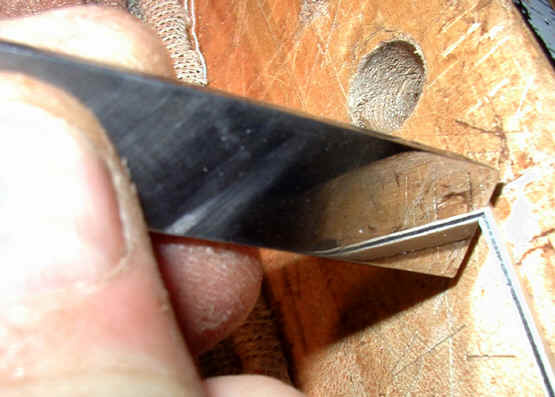 That way you can see exactly the angle of the cut and can match it to the angle you need. 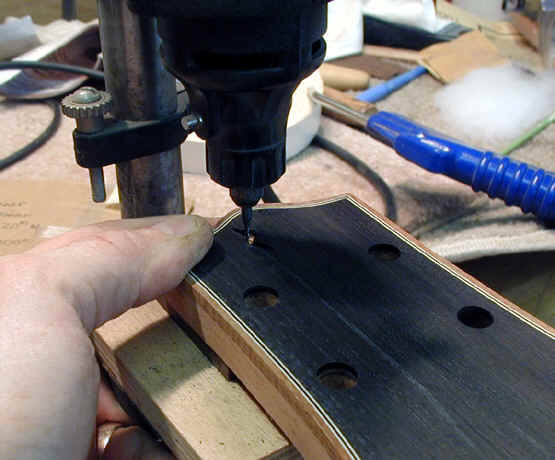 This jig helps to drill locating holes so that the fingerboard is properly centered and does not slip when gluing. Here the fingerboard is being glued to the neck. 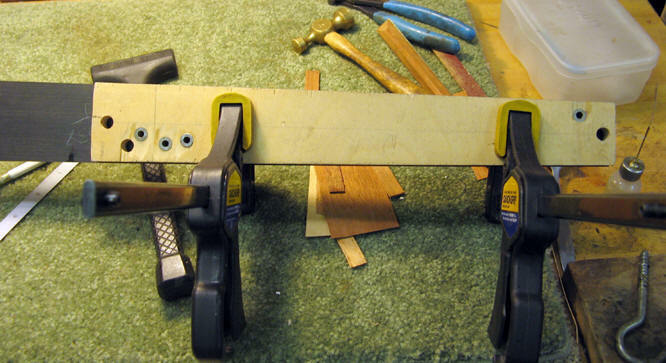 I always use lots of clamps!! 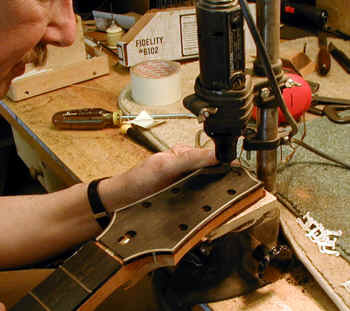 The fingerboard lies in a jig which matches the arch of the board and is cut out for the frets. 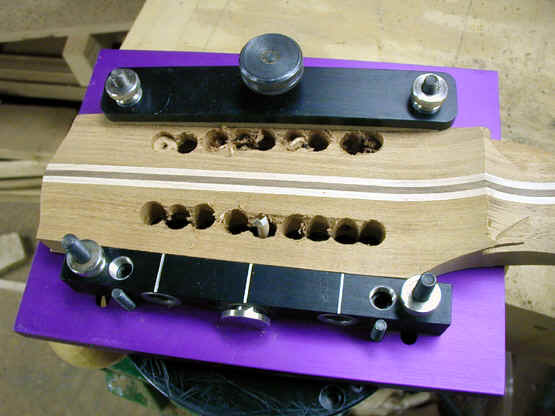 This way there is no pressure applied to the frets and the fingerboard is held perfectly straight. 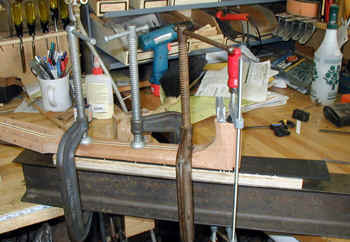 The whole apparatus is put on the straight steel I beam we keep in the shop (see, Tools I have Made) and the clamps are applied. 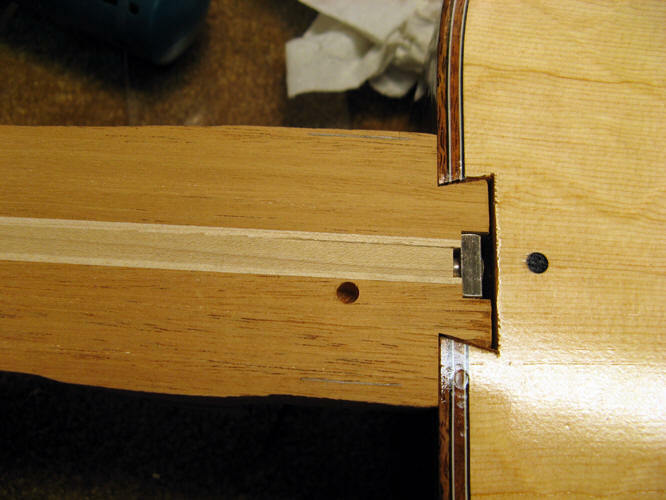 This ensures that the neck is glued up perfectly straight. 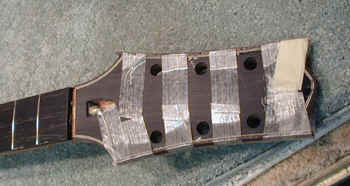 The caul I currently use for gluing fingerboards is made of aluminum - it was made by my friend Frank Ford.